The gravitas of GMO's (genetically modified organisms) stealthily infiltrating the food we consume has become a societal cause de jour. Irrespective of your ethical, moral or gastronomic stance on GMO's they are a ubiquitous topic of the 24 hour news cycle. Members on the cornucopia of social media outlets quibble ad nauseam about GMO's effects and the nefarious ways corporations deliberately mislead the public about the evils of GMO's. Grassroots advocacy groups and even militant eco-facists harangue the content vapid 24hour news organizations with their causality spin on the declining health of the world, which they allege is the handiwork of GMO's. On the other end of the pundit spectrum are the lobbyists, the naysayers and the pernicious Public Relations machines, who on the GMO' industry's behalf, vehemently deny any causality between the world's declining health and GMO's. These Public Relations firms are the marketing organs of a robust and thriving propaganda body which has been honing its public deception techniques for over 100 years. All of these handmaidens of corporate perception marketing, as well as those groups who oppose the proliferation of GMO's, are equally vociferous. Some might say that either of these pro or con groups are blinded to the deeper contextual meaning of GMO's. 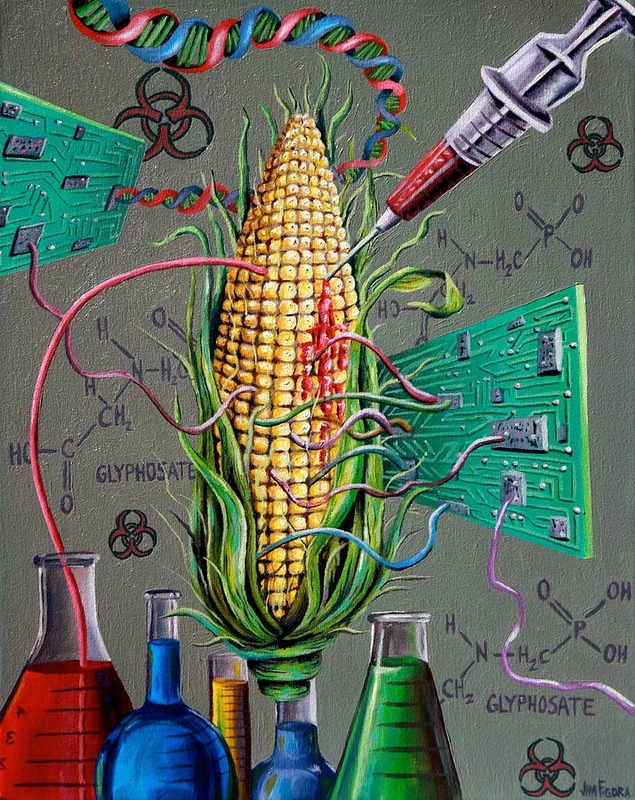 If the definition of GMO's is seen as a continuum from a proto-historical period through to the present, then the feud between the parties could take on vastly different proportions. In the Pulitzer Price winning book; Guns, Gems and Steel, author and academic Jared Mason Diamond examined the forces behind the rise of civilizations throughout history. He detailed the components which allowed for some civilizations to flourish and evolve into nation states and, conversely, portrayed the shortfalls of those civilizations which remained in arrested development. According to Diamond, a keystone to the continued evolution of civilizations into nation states was the successful manipulation of food stuffs. These food stuffs, or staples, are categorized in the book as being maize, wheat and rice. The manipulation of these food stuffs, in addition to available meat (protein sources) and environmental situations, which occurred over thousands of years, is the linchpin in the development and evolution of these civilizations. The irony is that the pervasive hate ethos which Monsanto receives can be contrasted to the early modern and proto-historical realities. There are antique GMO's we gleefully and naively still eat today. These modified cucumbers were first developed in Dutch greenhouses. Seedless cucumbers were also serendipitously endowed with the nomenclature of being burpless. The low levels of cucurbitacins, compounds which cause the fruit to taste bitter and inhibit digestion, were removed during the process of cultivating the seedless-ness. It is naturally occurring on a color spectrum ranging from off-white to a mat purple. The hue was changed to the adoring florescent orange sometime during the 16th and 17th centuries. Although apocryphal, carrot lore has it t hat the color was changed to honor the Low Countries' King: The King of Orange. Initially bananas were as scarce in the world market as salt and pepper had been in the middle ages. In the early 1800's the 7th Duke of Devonshire, William Cavendish, received a shipment of bananas from the island of Mauritius in the Indian Ocean. Cavendish was able to cultivate this hardy strain of banana which spawned the commercially viable bananas. These bananas were essentially cloned from one source: the 'Cavendish' cultivar. At the end of the 19th century a new variety took root in the tropics in order to supply the increasing banana consumption of America and Europe: the Big Mike banana. The Big Mike had a major advantage over the Cavendish Banana in that its peel was significantly thicker which reduced bruising during shipping. The Big Mike was supplanted by the Cavendish in the late 1920's because it proved to be a hardier variety than the Big Mike. A soil disease, known as Panama Disease or “fusarium wilt”, had decimated the Big Mike crops. Panama Disease was less virulent against the Cavendish crops which motivated the banana plantations to return to the first banana Franken- Food. Cane sugar, like it's predecessors salt, Tyrian purple and pepper, was in high demand and limited supply; usually at exorbitantly inflated prices. Fredrick II , the King of Prussia, in the mid-eighteenth century vowed that his kingdom would develop a substitute for cane sugar. This surrogate would be gained by extracting sugar from sugar beets. Fredrick II financed an intensive scientific program devoted to experimentation aimed at developing processes for sugar extraction. The beet which was selected and modified was 'Weiße Schlesische Zuckerrübe', which means white Silesian sugar beet. Due to the fact that France was unable to receive sugar because of British sea blockades during the Napoleonic Wars, the Emperor Napoleon inaugurated schools dedicated to the study of beets and beet sugar. This was the birth of the nascent sugar beet industry which flourished at the end of the Napoleonic Wars. The bane of nearly anyone who cooks with onions is the uncontrollable sobbing after cutting into the fleshy veggie. In 2007 New Zealand and Japanese researchers came to the 2nd World Onion Congress in The Netherlands with a remarkable breakthrough in onion technology: The Tearless Onion. The science behind the Franken-Onion is a gene-silencing technology known as RNAi. The dubious good new is that no foreign proteins have been fused with the onion which research indicates will allow for a hardier strain. The questionable bad new is that the onion won't be in anyone's kitchen for at least another 5 years.